Cartoon critics Phil Witte and Rex Hesner look behind gags to debate what makes a cartoon tick. This week our intrepid critics examine cartoons about the trials of taxes. April is the cruelest month, as T.S. Eliot observed and Mick Stevens illustrated. The tax deadline looms ominously from the first of the month, and no other date in April carries any significance. 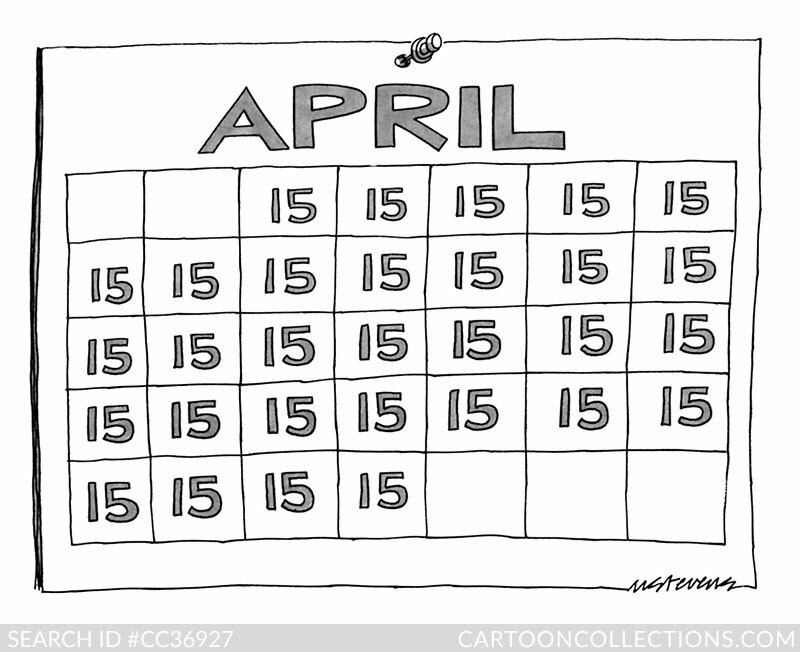 While not intending to nitpick Mick’s cartoon, we note that the IRS may take issue with any taxpayer who believes that April 16 though 30 is still April 15. The anxiety surrounding the subject of taxes is aptly captured in Warren Miller’s update of “American Gothic,” featuring a suburban couple about to be squashed by a cabinet full of tax documents. Clever touches include the substitution of a rake for a pitchfork. This vertically oriented cartoon contrasts the motionless couple with the falling object of doom in a wordless tableau. But where does this file cabinet come from—the clear, blue sky? Don’t ask. The only reality that matters is that paying taxes is a painful experience. Taxes put a damper on the most joyous occasions, a reminder that every silver lining has a cloud. 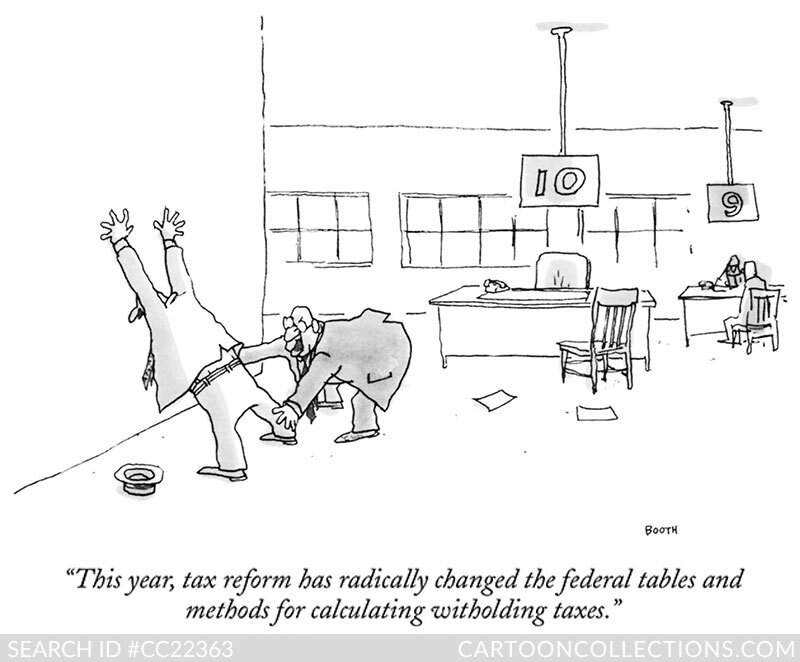 Right behind the man with the oversized check is the tax man with and even larger 1040 form, in Ben Schwartz’s cartoon. The expression on the face of the sweepstakes winner has undoubtedly changed from elation to concern, as she and the check guy eye the IRS agent. How did he find them so fast? Easy—he followed the money. 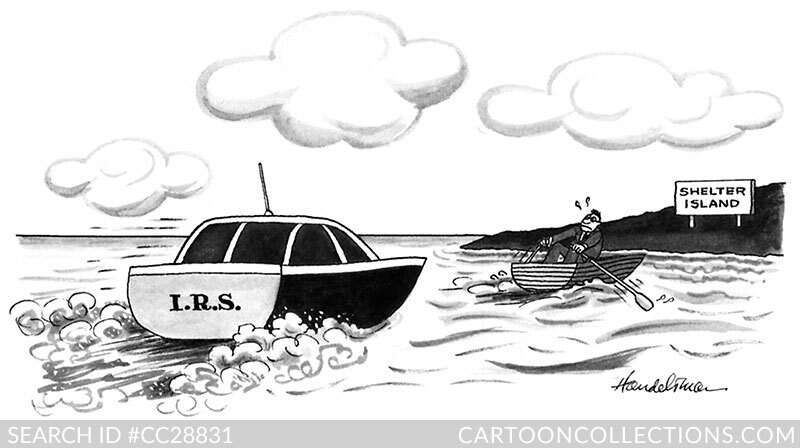 This cartoon by J.B. Handelsman evokes an almost nightmare level of anxiety associated with the IRS, here depicted as a speedboat with blackened windows, chasing after a man paddling furiously in a tiny rowboat. He won’t just be audited; he’ll be annihilated. This image could almost be a scene from a Stephen King novel. Yet, one may ask just how sympathetic is the desperate man. He’s a businessman seeking a tax shelter, made physical by “Shelter Island.” Is he deserving of the tax shelter, perhaps one available only to the very wealthy? In any case, this cartoon uses a seagoing metaphor to great effect. And, this cartoon, like the three cartoons before it, presents the gag without the help of a caption—quite an accomplishment. Then there’s the tax audit—the ultimate invasion of fiscal privacy. 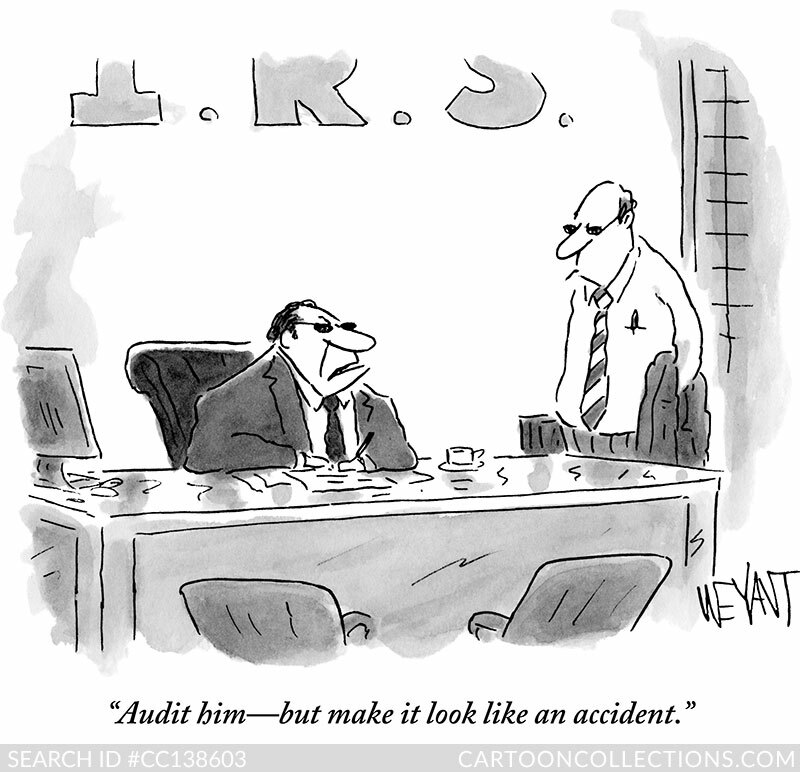 So fearsome is the tax auditor that he is represented in this Chris Weyant cartoon as a mob hitman. The dark sunglasses and toothpick in the mouth say tough guy, but the pen in the shirt pocket says CPA. The bottom half of the agency’s initials are enough to send a chill down one’s spine. 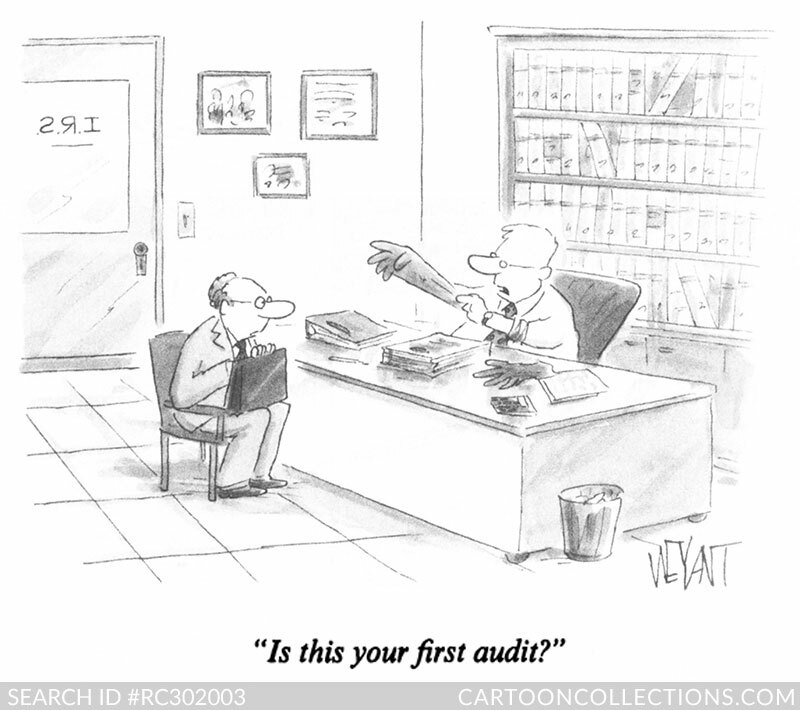 The same cartoonist, Chris Weyant, draws a medical analogy in this face-to-face confrontation with the tax auditor. The IRS agent takes a more professional approach than the mobster did, but that provides little comfort to the anxious taxpayer, who uses his attaché case as a makeshift shield. We can imagine what comes next—though we prefer not to. Veteran cartoonist George Booth takes the audit scenario one step further by depicting the physical contact between auditor and taxpayer. The agent’s dry assessment of the current tax laws contrasts with the up-against-the-wall method of extracting income. This amounts to a clear case of federal overreach. Death and taxes are said to be the two certainties in life, and negative feelings are generally associated with both. 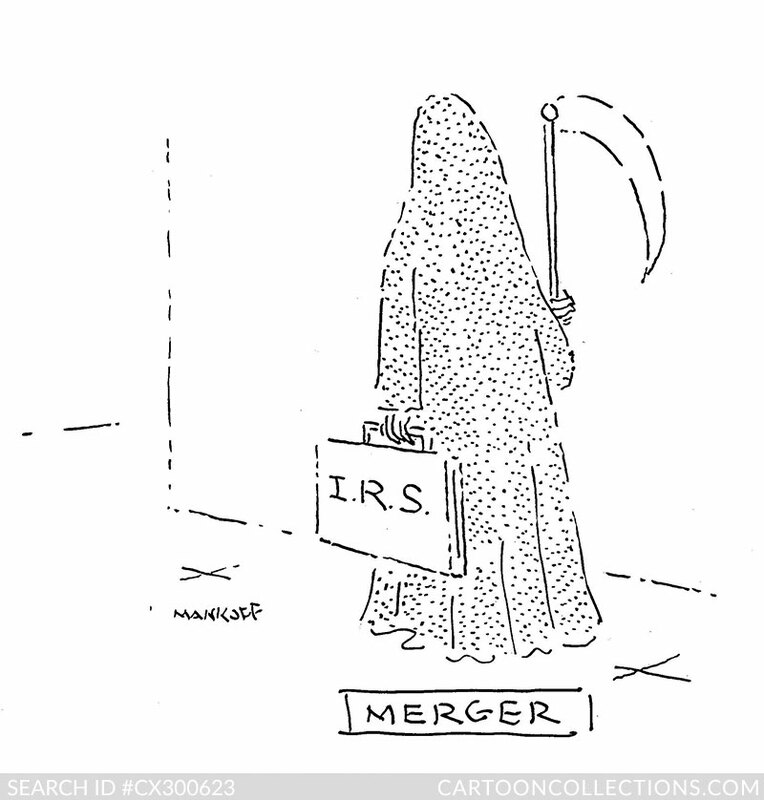 So firmly linked are death and taxes that a merger could be imagined—as was, in fact, by Bob Mankoff in this cartoon. Presumably, Death will need to set down his briefcase so that he can grasp that scythe with both bony hands. 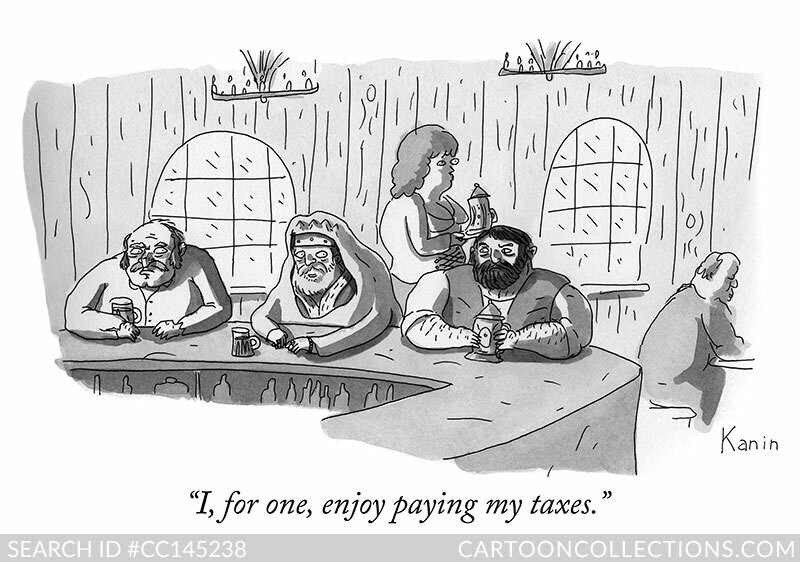 All of these cartoons reflect the obvious distaste for paying taxes. Who in their right mind enjoys it? Zach Kanin figured out who might express such thoughts: a king, nominally incognito, hoisting a pint among the peasants at the alehouse. His uncertain expression suggests he is testing the line to see what kind of reaction he’ll get from these stout laborers. Probably not a good one. Leo Cullum looked at tax time from the taxpayer’s perspective. 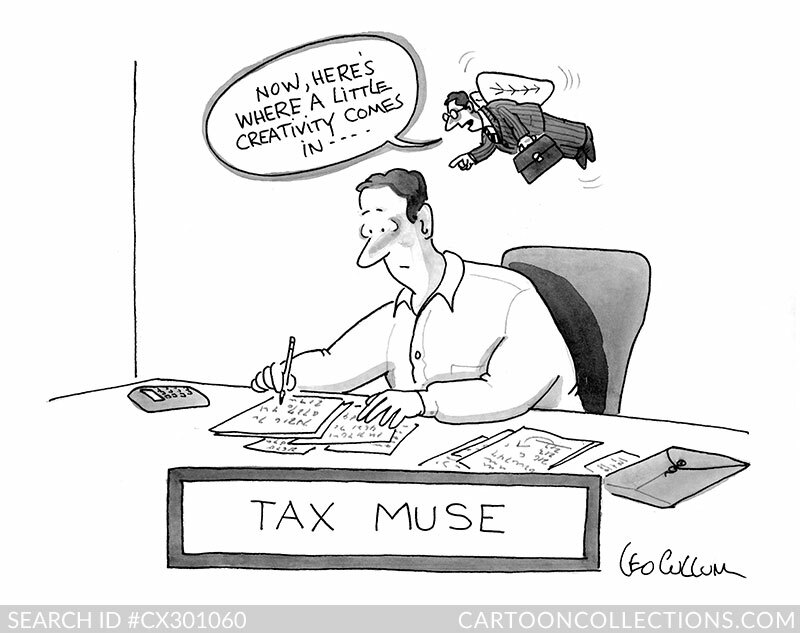 This fellow sits alone scribbling figures, but the tax muse may inspire a creative way to characterize an expense as a deductible. The gag turns on comparing creative accounting to creative fiction—and some overlap exists, in a sense. In another Leo Cullum cartoon, the taxpayer receives good news for a change: a healthy, baby tax deduction. The gentleman, a business type, looks quite pleased, although the news is nothing to get up about. 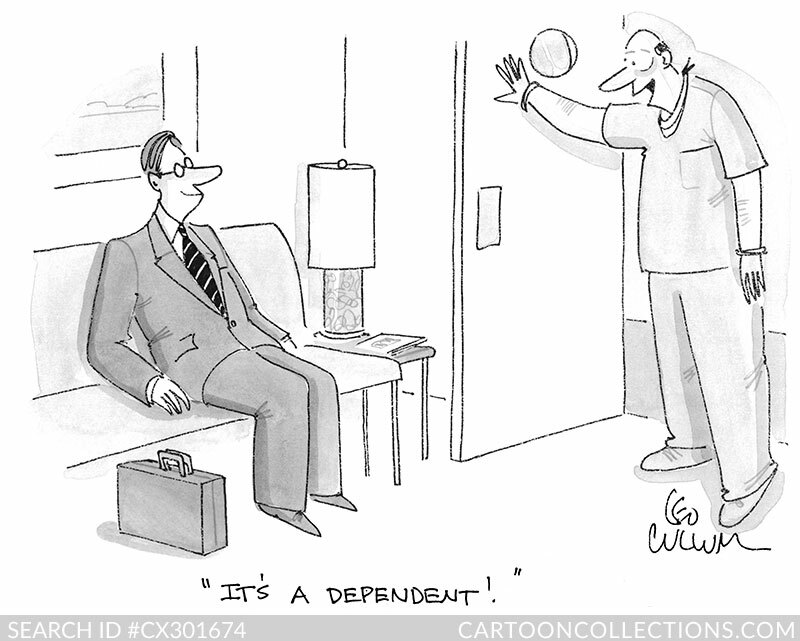 Setting a tax cartoon in a maternity ward takes an imaginative comic mind. 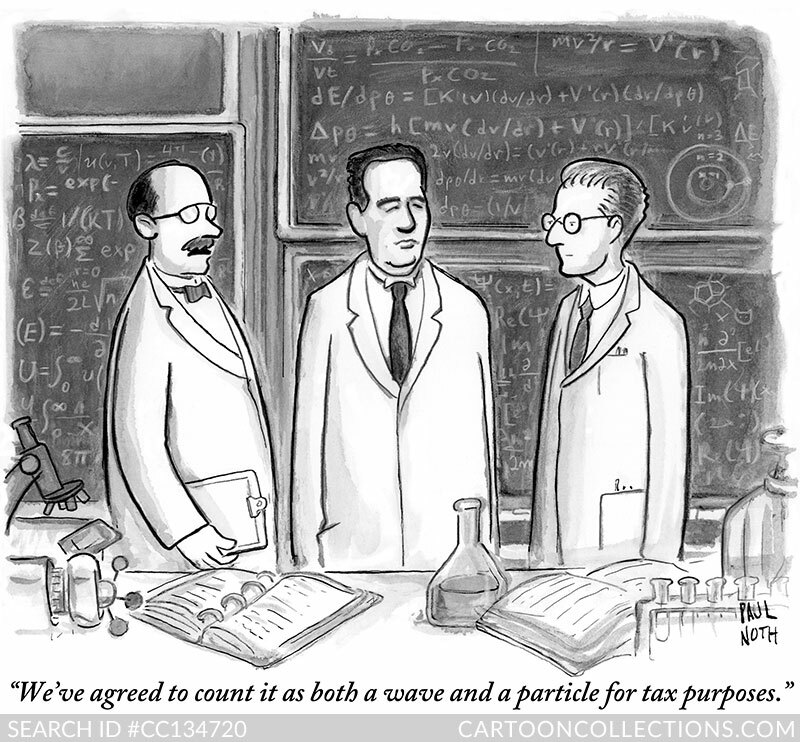 We end with a cartoon that removes taxes from its usual sphere of reference to the abstract arena of subatomic physics. Little details, such as the shirt collars and hairstyles, as well as the cartoon’s gray hue, suggest that this scene is set some time in the 1930s, when European scientists fled fascism to the safety of American universities’ physics departments. Is light a particle or a wave? Fortunately, the tax laws provided the answer. 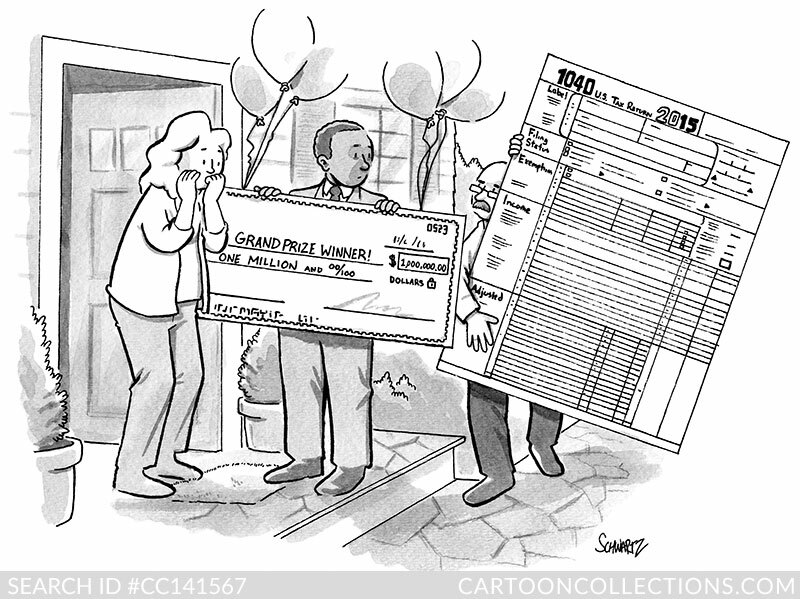 You don’t need to be an Einstein to understand this marvelous cartoon by Paul Noth.